When Alex Grey's book, SACRED MIRRORS: The Visionary Art of Alex Grey (Inner Traditions) appeared in 1990 many people working in the fields of transpersonal psychology, subtle energy healing and bodywork, and the psychedelic or rave culture recognized a kindred spirit. New York Times art critic Helen Harrison said,"Mr. Grey's paintings, as detailed and anatomically accurate as medical illustrations, present man as an archetypal being struggling toward cosmic unity...Grey's vision of a flawed but perfectible mankind stands as an antidote to the cynicism and spiritual malaise prevalent in much contemporary art." Grey's work has been exhibited worldwide, including Stux Gallery and the New Museum in NYC, La Luz de Jesus gallery in Los Angeles, the University Galleries of the University of Illinois, Normal, IL, the Grand Palais in Paris, and the Sao Paulo Biennial in Brazil. Grey has been an instructor in Artistic Anatomy and Figure Sculpture for seven years at New York University and in the past few years has been teaching a course on Visionary Art along with his wife Allyson Grey at Omega Institute in Rhinebeck, NY and since 1995 at Naropa Institue in Boulder, Colorado. What caused your interest in Art and the Spirit? 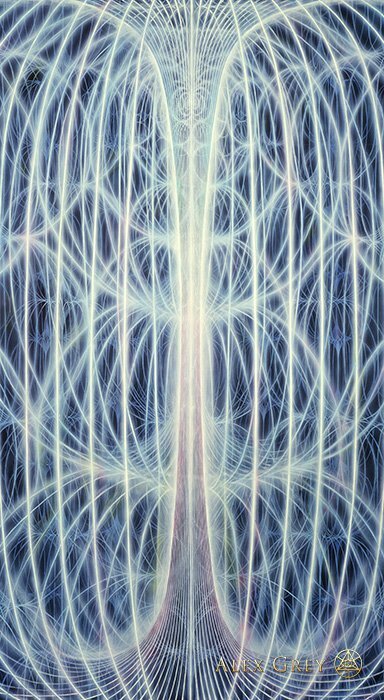 Alex Grey: I was fascinated from a very early age with the themes of mortality and polarity. 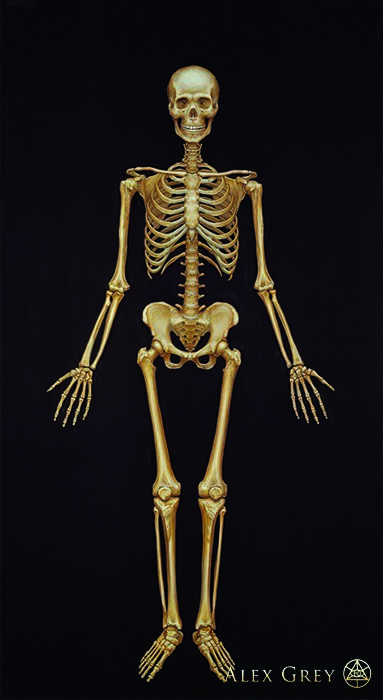 One of the earliest paintings I made, probably from when I was 4 or 5 years old, was of a skeleton. At 8 and 9 I used to bury dead animals in our backyard cemetary, until one day I was bitten by a rabid bat. I had to endure a painful series of rabies antitoxin injections with a serum that was made of dead dried duck embryos which left a big lump under the skin. At 10 I remember watching my grandmother turn jaundice yellow and asking my dad when she would be getting better. He said that she wouldn't get better, that she was dying. These things taught me something about impermanence. I think this early brush with the non-living as well as with medicine may have warped my art subject matter. I really wondered what happens to people after they die, do we have a spirit? Where does it go? In 1975, after returning from a journey to the North Magnetic Pole in which I attempted to psychologically link up with the geomagnetic field around the earth, I realized I was looking for was God. I wasn't sure what "a search for God" meant, but I put it out as a prayer. The very next day I was given my first LSD trip, and I met my future wife, Allyson. My prayer had been answered. Over the years we continued our sacramental psychedelic experiences together which gave us confidence in the infinity of Divine Love and the Imagination. We have explored various spiritual paths together and I remain committed to a form of Tibetan Buddhism. We continue to explore the link between art and spiritual practice. In what ways are the devotion and concentration necessary to making art like the devotion and concentration used in meditation? In what way can art be an initiation, a healing spiritual process? Why do you focus on the human anatomy in your paintings? 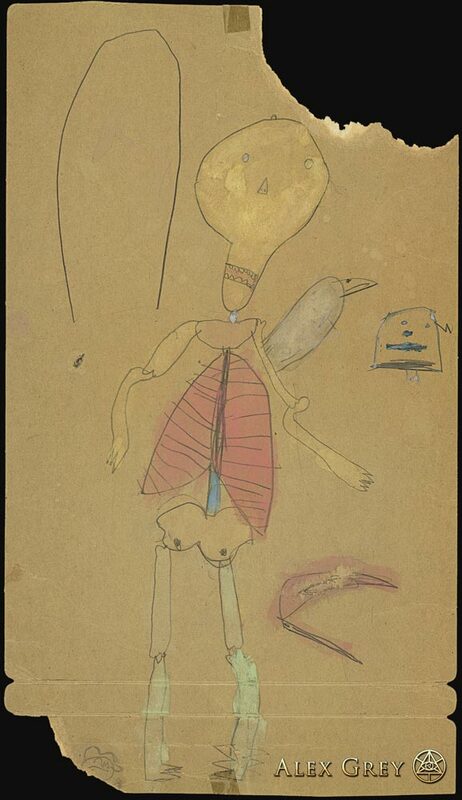 Alex: I began to see that the human anatomy is a microcosm of the many systems and levels of order in nature. I spent several years at medical school working in a morgue preparing cadavers and studying the human anatomy. I wanted to make art about consciousness but felt my work would have to be grounded in gross anatomy, because the physical vehicle is the temporary residence of the mind. During the 1970's and 80's I did numerous performances and installations based on my visions. 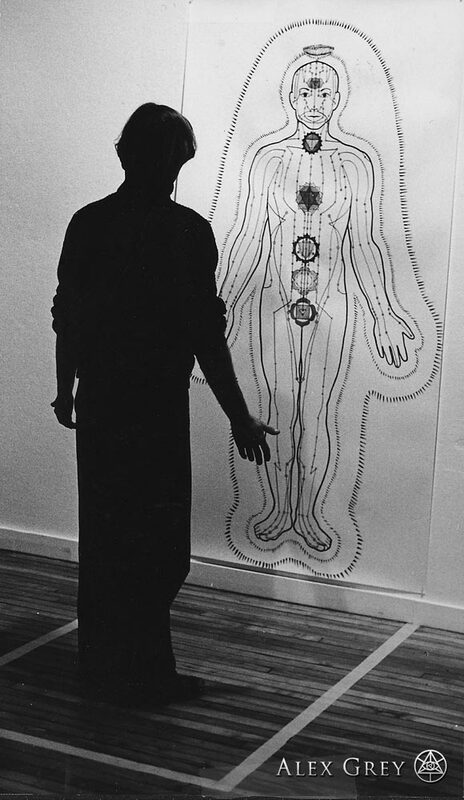 One of these performances was called Life Energy and in it, among other things, were black and white drawings, life-sized charts of the nervous system and the Eastern life energy systems. I used these charts to make a point about the relation of Eastern and Western concepts of consciousness and life energy. I had demarcated a space in front of them for where the viewer could stand and "mirror" the system with their own body. My wife Allyson noticed the popularity of the charts and she suggested that I develop this idea further by doing paintings of the physical and metaphysical anatomy. I knew she was right even though I felt doomed by the project. Begun in 1979, the Sacred Mirrors took a period of ten years to complete. The Sacred Mirrors are 21 life-sized paintings that examine in detail, the body, mind and spirit of an individual. After painting the Sacred Mirrors, I applied this multidimensional perspective to painted visions of such archetypal human experiences as praying, kissing, copulating, pregnancy, birth and dying. I portray the body as translucent and hyper-real. Complex anatomical systems are revealed then interwoven with the glowing subtle energies visible to clairvoyants. The "real" character of the anatomical X-ray of the body may seduce the viewer into acceptance of the subtle energy realms. 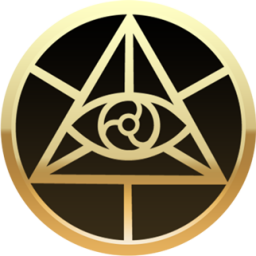 By seeing and identifing with the vital, psychic and spiritual energies of the subtle bodies the viewer may broaden their identity beyond the physical body and provide for the influx of healing energies from a more perfect spiritual template. Perhaps this is a way that art may directly stimulate a subtle healing response. By using the visual metaphor of transparency my paintings allude to the process of becoming transparent to the sacred ground. Transparency also allows one to point to dimensions parallel to and interpenetrating the visible phenomenal world, such as the "astral creepy crawlers", the lower demonic forces and higher luminous angelic presences or diety figures. The visual allusion to these different realms is what I mean by a multidimensional perspective. Can you actually see the energies that you portray? Alex: I have gotten comments and letters from clairvoyant healers who claim to be able to see the human body as though it were translucent, surrounded and interpenetrated by auras and energy channels, looking much like my paintings. Many tantric texts explain that clairvoyance will develop as a byproduct of spiritual practices. I believe that the ability to see these various layers of reality is a talent which some people are born with and some people have developed, but it is also a talent which is potential in all people. In dreams, meditation or during altered states I have had visions of these subtle hidden dimensions, but it is not an everyday occurance for me. In early modernism many abstract painters were motivated by mysticism and spirituality. Do you feel that your work is related to theirs? Alex: Artists like Mondrian and Kandinsky used abstraction to express the spiritual in art, at least that was their intention, but as great as these painters were, I think that they may have fallen short in this regard. When you submit their work to the average viewers response, I am not sure that the word spiritual would come up. Alot of art criticism has also steered people away from interpreting modern art in this way. Most 20th century art critics like Greenberg, Rosenberg, Kuspit, Danto focus on the formal, psychoanalytic or sociopolitical dimensions of the work of art. Unfortunately, most art critics don't have a clue about the mystical experience or the primary importance spirituality has always played in the development of art, or if they do have a familiarity with the subject it is merely on an intellectual level. Recently however, there have been more spiritually motivated re-examinations of the nature of art by critics like Carlo Mc Cormick, Suzi Gablik and Roger Lipsey. This is an encouraging sign. As far as my motivations, I would say YES, I share a similar motivation toward expressing the spiritual in my work as the early modernists, but obviously, I do not reject representations of the body as they did. Our problems are the same, though, because we are 20th century artists, "How do we create sacred art outside of a specific sacred tradition?" Prior to the modern era, most artists who were creating sacred art were working within various traditions. There is Christian icon art, Tibetan Buddhist Art, Jewish and Islamic calligraphic art, Tantric and Indian art, the various religions have had various but specific sacred forms or models which are repeated with some variation but mostly with an aim toward reproducing the pre-existing form. Contemporary sacred artists, working outside of specific traditions must find personal "original" forms which characterize their own mystical or spiritual experiences. I put the word "original" in quotes because new sacred art still draws upon essential and archetypal symbology, the medium of truth for all established spiritual paths. In the throes of a mystical experience the divine imagination will shamelessly plunder the world's spiritual traditions and ransack the collective unconscious in order to deliver fresh, honest universally meaningful images. Those are the artists who should be making contemporary sacred art--the ecstatics who have had mystical experiences. In his book The Idea of the Holy, Rudolf Otto writes of the "mysterium tremendum", the experience of losing control and of awe, dread and terror when confronting the Transcendental. This is something that I think alot of "New Age" art forgets about. Like Rabbi Hillel said, "God is not just flowers and bird songs, God is an earthquake." There is a categorization of aspects of the mystical experience put together by William James and Walter Stace. These categories are some of the most important common denominators of the mystical experience. First, a sense of oneness or unity within oneself and with others or with the whole of existence. With unity comes a sense that ordinary time and space have been transcended, replaced by a feeling of infinity and eternity. There is an ineffable or undescribable nature to the experience, something beyond words. The mental chatterbox shuts up and allows the Ultimate and true nature of reality to be revealed, which in some strange way seems more real than the phenomenal world which is experienced in ordinary states of consciousness. In the same way that we waken from a dream and realize the more "real" nature of our waking state, in the mystical state one awakens to a higher reality and notices the dreamlike character of our normal waking state. When people do begin to describe the experience or reduce it to words, these statements seem to be inherently paradoxical or illogical, such as "form is emptiness, and emptiness form" or "Thou art that". These are true statements coming from the perspective of non-duality, the problem is that rational discourse is dualistic. Perhaps that is why poetry or various art forms may more strongly convey the nature of the mystical state. With successfully spiritual works of art, our dualistic rational mind may be temporarily suspended and we fuse with the mystical state being symbolically transmitted through the art. Do you have any advice for today's artists? Alex: An artist named Lowell Tolstedt told me something when I was a student that I still think is true. He said, "Many young artists have advanced technical skills but nothing worthwhile to say. Many other young artists really have something important to say, but have no skillful means for doing so. Rare is the artist with skill who actually has something significant to say." The only way to develop technical ability, as you know, is to keep working and work alot. In order to say anything of importance you must find your source - your creative wellspring - the issues - ideas - the matrix of meaning that keeps your art alive. Questions that act like a piece of sand or grit in the oyster shell of the mind may be the source of the pearl. In order to be successful and to be motivated an artist needs a mission. A mission is the setting of intentions to perform specific actions in the world - like the Apollo Moon Mission or the TV show from the 60's - Mission Impossible. But consider this definition: "a body of persons sent into a region for the spiritual betterment of the inhabitants". Immediately we think of "the religious missionary", people who go to remote outposts in the world to "spread the gospel to the heathen savages". When an indigenous culture is destroyed by importing guilt ridden dogmas, totally foreign to the attitudes of the natives. that's a negative Mission. On the other hand one does have a desire to better our physically and spiritually depleted world. How can we do that with our art? Art is unlimited, it can be anything we want it to be. An artist can hold a mirror up to society or the world. We know the condition of the world from the daily news reports. We are in a crisis. Another option is to posit an ideal of what the world can become. How can we do this in our art - what cultural gestures have transformative significance? The Tibetan Buddhists use the word Bodhichitta to describe awakening the mind of enlightenment. Without the correct intention there is no advancement toward enlightenment. The practices just don't function. The correct motivation is not that you are seeking enlightenment just for yourself but rather for the benefit of all beings. It's almost a foreign notion to us that what we are doing could be for the common good. I remember the Dalai Lama did a public talk after he had done a week long teaching on esoteric Buddhism. At the public talk he tried to make everything as simple and straightforward as possible, he said, "I am a human being. You are a human being. Try to be a good human being, not a bad human being." In the same way, correct motivation is critical for the artist. The type of energy you put into your work has an effect on yourself, your viewers and the collective psyche. Artists must think deeply about what type of energy they want to put into the world. There is an ethical dimension to works of art. I've always thought that artists are in some way cursed with their drive to create art, yet they are also blessed by the spirit of universal creativity. One of the curses of creativity is the sense of isolation that an artist can feel in a social context that ignores, misunderstands or maligns the artists best efforts. Likewise, the curse of the muse may drive an artist to do things that even they have no idea about what or why they are doing. In this way listening and responding to the inner voices or visions is akin to madness. There is something a bit insane about the efforts of the solitary artist when one looks at it with the cool eye of materialistically driven rationality. The artist must live with ambiguity, with not knowing what will come next, with not being in control. And not all creative voices or visions are benevolent. The unconscious is a big place, it contains both heaven and hell. Wherever there is a deity there is a demon. For an artists work to have lasting value they must have experienced the full spectrum of consciousness and must actively channel that all encompassing sense of life into their creative works. That is why great art disturbs us and shocks us. We are drawn out of our limited sense of being, our ego shell is cracked and we glimpse the profound undercurrent of spirit, the entire universe condensed into one sound or form, a spark from the unmoved mover leaps into our souls. Art is nutrition for the soul. That brings us to the blessing of the artist. Blessed are those who dream dreams and dare to make them come true. The artist is driven to realize their dreams, they must have courage. The artistic consciousness dwells in a region beyond rationality. Inspiration is not logical. Inspiration is like an unseen lover who creeps up to you and gives you the most sumptuous gifts. The creative imagination is the genie in the magic lamp of the mind. No object or project ever created by an artist will ever equal the images and artworks you will see in your own imagination. Use it and enjoy it!